1) Is it heavy as compared to most rocks? Meteorites have a high specific gravity and tend to be denser than most earth rocks. This is not only because of the types of minerals found in them, but because almost all of them have varying amounts of malleable iron-nickel grains. This amount ranges from a few percent to 100%. About 93% of all meteorites seen to fall are stones, and only about 5% are solid nickel-irons. The rest, less than 2% are the stony irons having an almost 50-50 mixture of stone and malleable iron-nickel. To see the metal or metal grains within a meteorite you must grind a small window on the specimen. Often metal grains appear on broken surfaces of stone meteorites as rust spots, especially if it is weathered. And if the object in question is solid iron-nickel then it will look exactly like a rusty lump or chunk of steel that is silvery inside. Because iron meteorites are comprised almost entirely of malleable metal, when struck with a hammer they will dent or bend rather than break. On the other hand, stone meteorites will pulverize, and within the brittle stony matrix are malleable metal grains that flatten rather than crush. Because malleable iron-nickel is extremely rare on earth, but common in most meteorites, it is one of the distinguishing characteristics in determining whether the rock in question is meteoric or not. Campos Sales, Brazil; L-5, (stone), Fell Jan 31, 1991. 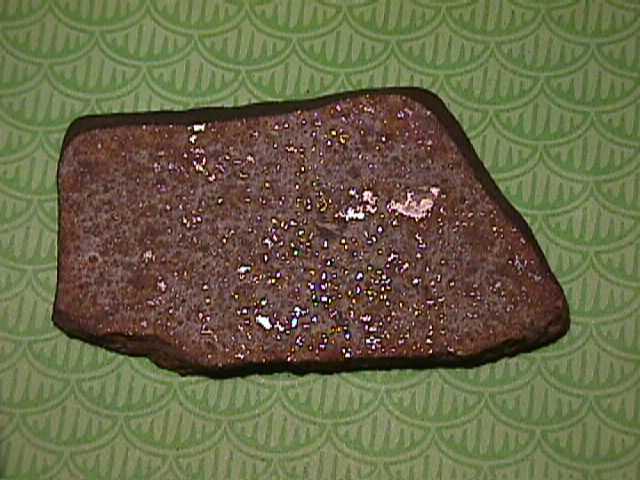 This 96 gram full slice is from a stone that was picked up shortly after a bright meteor was sighted. Notice the white malleable metal grains in this expertly cut specimen.